2 Bedroom Semi Detached House For Sale in Sheffield for Guide Price £125,000. SITUATED ON A CUL-DE-SAC IN THIS POPULAR & CONVENIENT RESIDENTIAL AREA ENJOYING THE FACILITIES OF CRYSTAL PEAKS SHOPPING CENTRE, DRAKE HOUSE RETAIL PARK & ROTHER VALLEY COUNTRY PARK IS THIS GENEROUSLY PROPORTIONED 2 BEDROOMED SEMI DETACHED HOUSE AVAILABLE TO MARKET HAVING IMMEDIATE VACANT POSSESSION AND NO ONWARD CHAIN INVOLVED. 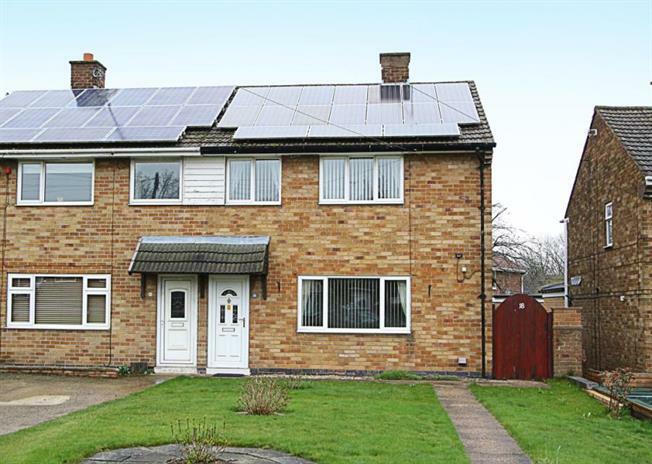 THE PROPERTY BENEFITS FROM uPVC DOUBLE GLAZING & GAS CENTRAL HEATING. The accommodation in brief comprises: Entrance Hall leading into the front facing lounge, a door then leads into a inner hallway providing stairs to the first floor landing and doors into the ground floor WC and a storage room. Breakfast Kitchen overlooking the rear garden with a range of base & wall units with integrated appliances to include gas hob, extractor fan, electric oven, as well as having space and plumbing for an automatic washing machine. A pantry provides further storage and a rear facing entrance door leads out onto the rear garden. To the first floor landing: loft access and airing cupboard and doors lead into Two double Bedrooms and Shower room having a wash hand basin, low flush WC and shower enclosure having electric shower within and tiling to the splash backs. Outside: to the front of the property is a good sized lawned garden offer the potential to add a driveway (subject to necessary consents), whilst to the rear of the property is an enclosed rear lawned and fenced garden with two brick built Store places and garden shed. Location: Beighton is extremely popular with buyers of all ages, sought after for its superb local schools and close proximity to Rother Valley Country Park. The area boasts excellent local transport links both by bus and Sheffield Supertram, and is ideally situated for links to both the M1 motorway networks and Sheffield City Centre. There are excellent nearby walks on the Pennine trail and the area offers a superb community feel with activities based at the 'Lifestyle' centre and Beighton miner's welfare centre home of the local Beighton Magpies football club. Ideally placed for Crystal Peaks Shopping Centre, Drakehouse Retail Park and a short drive to nearby surrounding local Derbyshire countryside the area has plenty to attract all buyers.